Members of the Society have helped many people researching their family histories. Family interests are listed by members and included in the Membership List so that members with similar interests can contact each other. The list is only available to members. Information on many properties and families is kept in named files in the History Room in Community Office. The society also has copies of books and articles on the area and relevant documents such as poll tax lists, muster rolls, lay subsidies and Charity Commission reports. The room is open to the public. The archives hold copies of parish registers, tithe maps and schedules, censuses, land tax returns, deeds and wills, as well as an extensive collection of photographs dating from about 1858 onwards. Trinity College, Cambridge has contributed many documents concerning St Andrew's Church, and Sedbergh School has provided the surviving governors' minutes up to 1874 when it ceased to be the Free Grammar School of King Edward VI In Sedbergh. 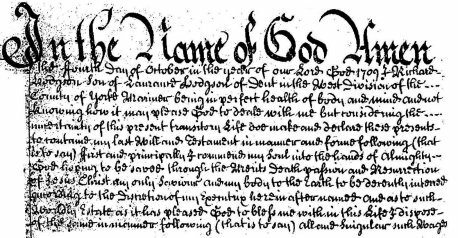 Extract from the beginning of the will of Richard Hodgson 1720,Mariner of Dent. Others wills available include William Sill, 1784, brother of John Sill of Jamaica and West House in Dent, Miles Mason, 1822, the potter born in Dent 1753, and transcripts of many others.